Here are a few ideas for creating a festive feast your little ones are sure to love. First, layer the table with a sheet of butcher’s paper as a sort of tablecloth. Then cut a sheet of yellow, orange or green paper to go down the center of the table as a table runner. Use Mayflower style boats like the one below from Martha Stewart as the place cards. Hang pilgrim hats and feather headbands on the back of each chair for the children to wear during dinner. The ribbon style headbands featured below from Martha Stewart and pilgrim hats from Iparty look authentic and are easy to make. Set up a separate table in another room with paint, smocks, paper cones and milk cartons. When the children arrive, ask them paint a house or a teepee. Then, line the teepees and houses down the center of the dinner table on the table runner as the table décor as shown in the photo featured below from Parents.com. The result is a special pilgrim and Indian community for all to enjoy. Set up a few teepees and hang a fall leaf garland in a separate room for the children to play in after dinner. Use ready-made teepees and garland from Pottery Barn Kids or learn how to craft your own at zrecs.com. Before the evening is over, have each child write what they are thankful for on a turkey feather. 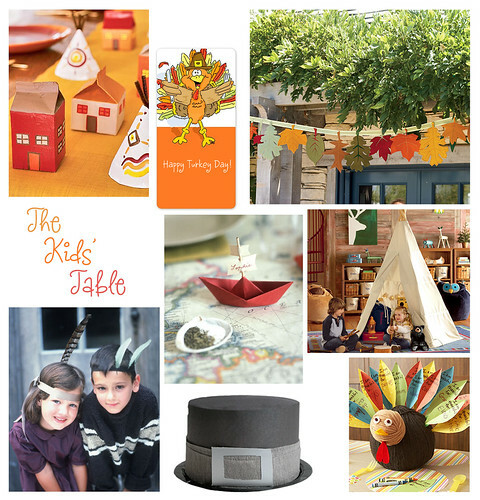 Learn how to make the adorable thankful turkey featured below at Parents.com.